It is a common refrain amongst gold aficionados that one ounce of gold has always and will always maintain the ability to purchase one "decent men's suit." Hence the notion that gold will always maintain a constant purchasing power. Judged by this metric, let's find out how one ounce of gold has done for the last 212 years. 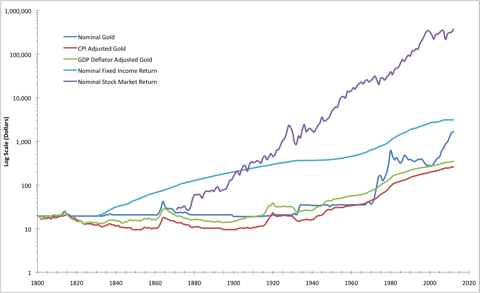 I have no personal bias for or against gold, but the merits of maintaining gold as a portion of one's wealth should be based on its historical performance relative to other asset classes. After all, gold is just that...an asset. Granted, it is a hard, tangible and shiny asset, which gives it a striking allure, but nevertheless, it is an asset whose value is subject to economic and market forces. The starting point for this analysis is the year 1800. I believe that duration provides a long enough runway to analyze. In the year 1800, the nominal price of one ounce of gold was fixed at $19.39. Adjusted for inflation to maintain a "constant" purchasing power, the price of gold today would be between $260 and $348 per ounce, depending on which measure of inflation is used (i.e, CPI or GDP deflator). 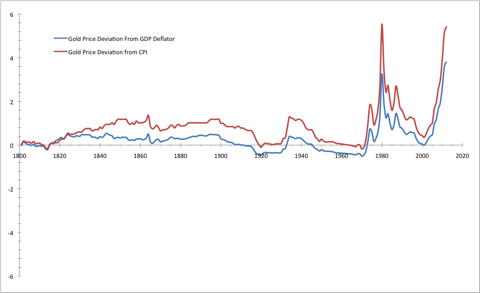 The chart below shows the deviation of the nominal gold price from the inflation adjusted price since 1800. At today's current price of $1,545 per ounce, gold has done a fantastic job of not only maintaining purchasing power, but increasing it five fold. 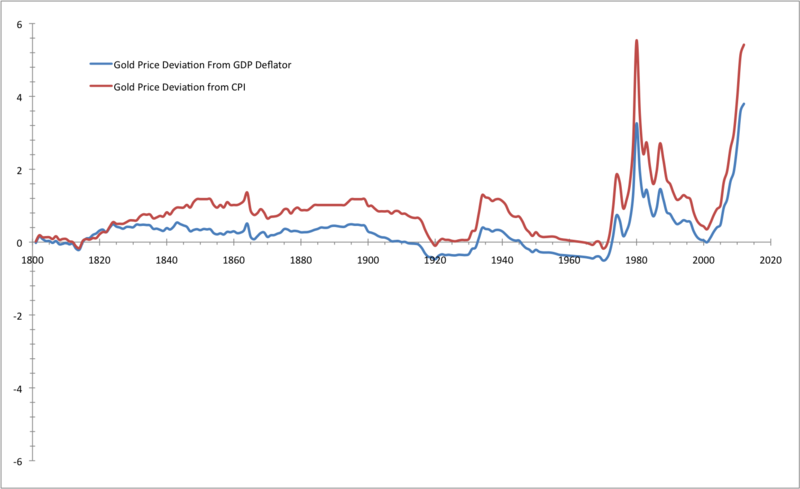 The only other period when the nominal gold price deviated more than 2x its inflation adjusted price was in the 1980s, albeit temporarily. How does that compare to other asset classes? 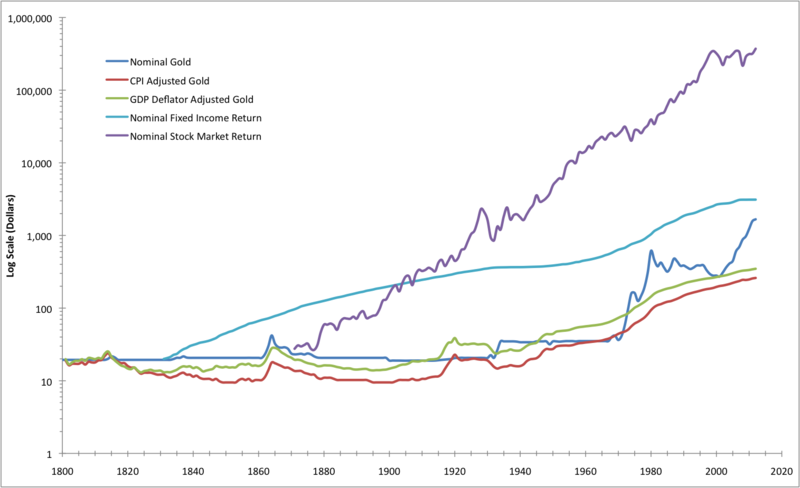 Using available data on short-term interest rates from the year 1831 onwards, and stock market returns from the year 1871 onwards, we can construct a picture of gold's relative performance. In 1831, if you had sold your one ounce of gold for the then nominal price of $19.39, invested the money in fixed income assets (i.e., bonds), and reinvested the coupons, the after-tax value of your investment today would be $3,112, or approximately two ounces of gold at today's market price. Assuming you were more risk averse and you had sold your one ounce of gold in 1870 for the then nominal price of $20.75, invested the money in equities, and reinvested the dividends, the after-tax value of your investment today would be $371,593, or approximately 240 ounces of gold at today's market price. If you were smart enough to have shifted from gold to bonds in 1831, and then from bonds to equities in 1870, the value of that same one ounce of gold today would be $1,458,527, or approximately 944 ounces of gold at today's market price. It's no wonder Albert Einstein called compound interest the "most powerful force in the universe." Okay, so gold has done a decent job of maintaining purchasing power. However, I'm not interested in just maintaining purchasing power, I'm interested in increasing purchasing power, and deferring consumption today so I can afford more goods and services tomorrow. For that purpose, gold is arguably and demonstrably not the best asset class to own. Today, one ounce of gold will buy not just one quality men's suit. I will buy three suits, a pair of shoes, a belt, and a shirt and tie to go with it. I suspect that, given the nature of gold to periodically return to its historical performance of maintaining a constant purchasing power, one ounce of gold will soon again afford you just one "decent men's suit."